Flight is a movie that grips you soon after it starts as you literally feel the terror of being trapped on airplane where a maintenance failure causes it to drop out of the air. You also are riveted as every scene of that crash is filmed and choreographed so well. You watched with fearful anticipation as an expert pilot is able to save most of the passengers in what would be term as a miracle in the film. At the center of this chaos is Denzel Washington. He plays the main character, Captain Whip Whitaker. His character’s name sounds heroic. The story centers on heroism and also character flaws. Deep ones. In this case, alcohol and drugs. 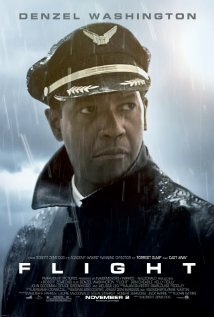 Yes, Denzel’s character was drunk and high on coke , when he piloted the doomed aircraft. The movie delves deep into the unraveling of lies of the hero and his alcoholism. The story is edgy but it is the acting of Denzel Washington that is stellar. I thought while watching his performance that I was literally in the presence of one of the greatest actors of our time. He is so nuanced and so believable in this very human Whitaker character. He is likable, but at the same time, you can see him wallowing in his self destruction. He does this dance with his destiny that you know will ultimately fail. In the end, the definition of hero is redefined. He certainly deserves an Oscar nomination and in my mind, the award for best male actor of the year. Director Robert Zemeckis does wonders with this film but it is Washington who makes it worth seeing. I hope you do.